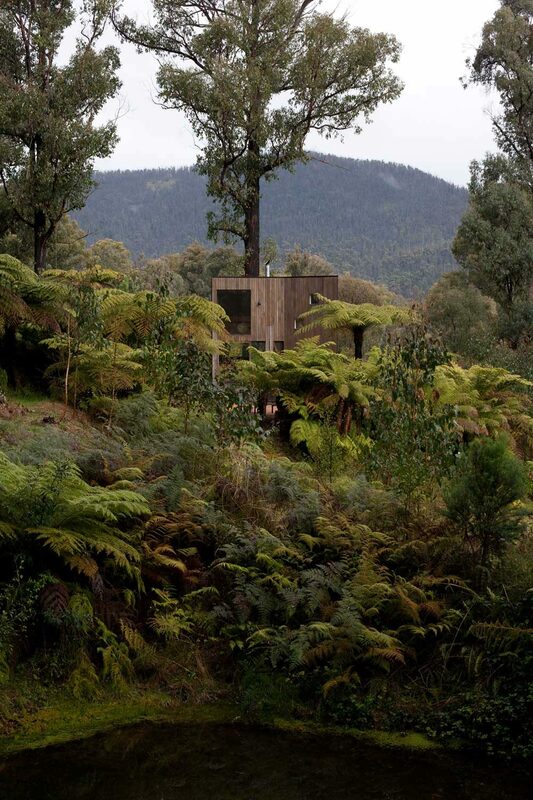 The Marysville House hides among the bushy green ferns and towering tropical hardwoods, creating a perfectly quiet retreat that gives back to the landscape just as much as it takes. 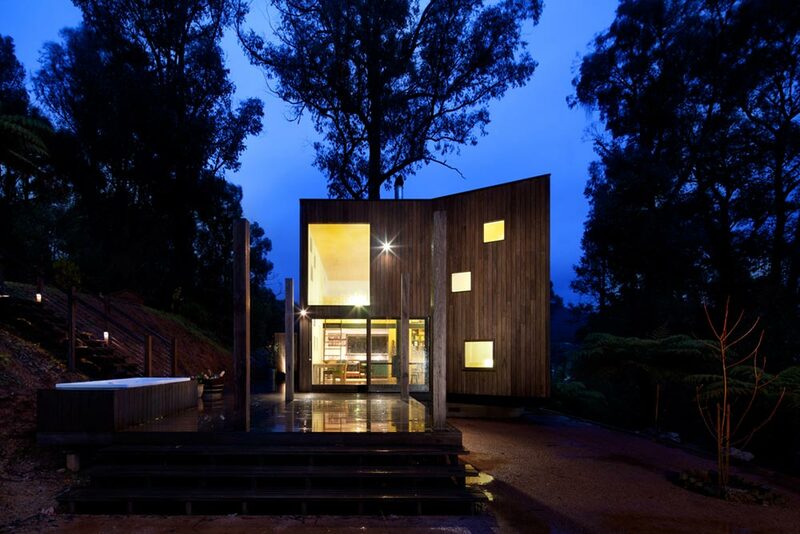 Steffen Welsch Architects designed this small yet mystifying two story holiday home that replaces a home once devastated by the Black Saturday Fires deep in the Australian jungle. In many ways, the home is a restoration not only of man-made living space, but of a surrounding environment that needed a bit of rehabilitation itself. 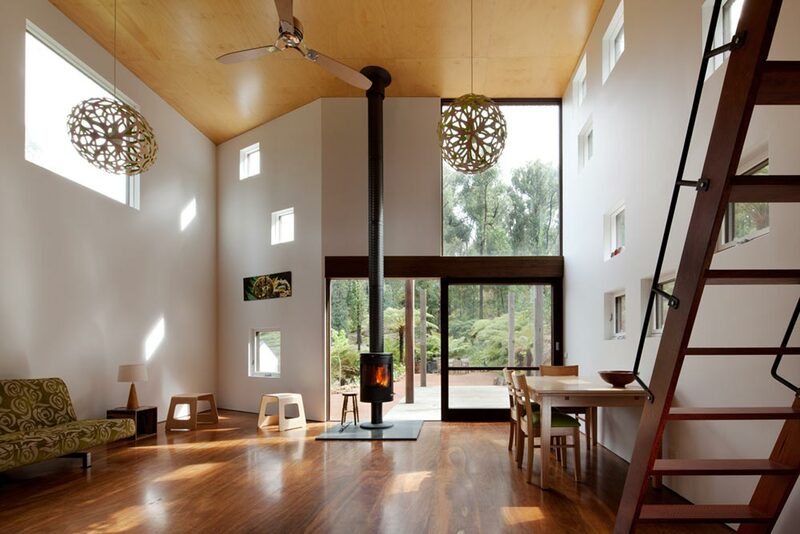 The home never interferes with its setting, but enhances in ways only the most eco-conscious architecture can achieve. Upon approach, the home emerges from the brush with an angled facade constituted of several rectangular punched openings. The other half of the almost symmetrical front facade has a trio of larger openings, which offer unobstructed views into the public areas of the home. The exterior facade is wrapped entirely in vertically oriented dark wood, which does well to mirror the foliage the surrounds the home. 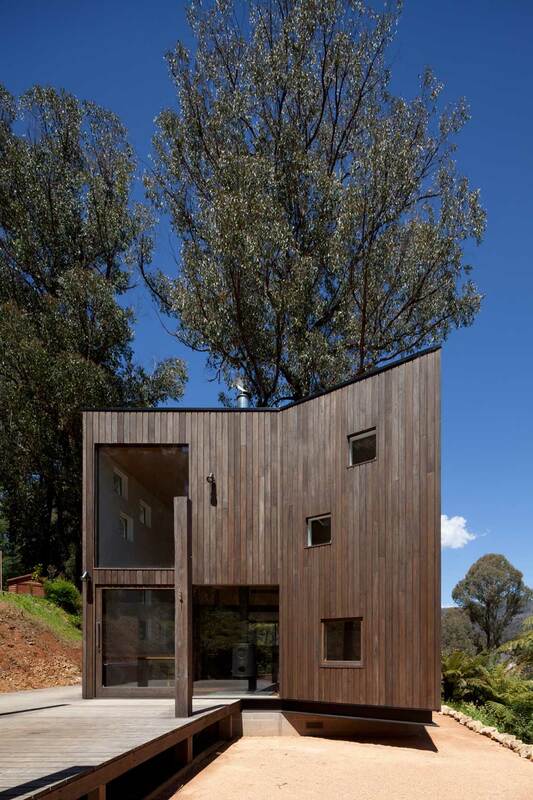 A modest wood deck brings visitors to the front door while an adjacent staircase carries people up the hill and directly into the wilderness. Initially, the home was to be designed as a much grander exploitation of raw square footage, however, as things moved along the decision was made to pair down the floor area in favor of a modestly sized footprint that made efficient use of interior space. It became more of an expanded studio with lofted living spaces that more than meets the clients needs for a quaint vacation home. The result is a stunning interior experience that never leaves nature far behind. 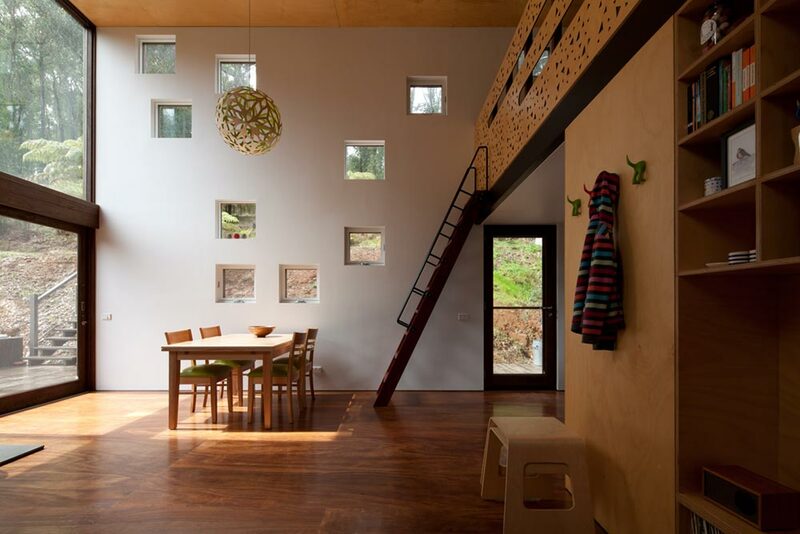 Each opening is positioned to take in a strategic view of let in an abundance of seasonal light. Simple, white walls are sandwiched between wood floors and ceilings, which provides an apt backdrop to the outside sights and scenery. A few intricate hanging pendant lights and a black wood burning fireplace provide accents that work well in the double-height space of the entry and living rooms. Moving past a meal staircase that goes up to a lofted bedroom area and you’ll find a cozy kitchen and dining space. The floor plan is easy and effective, giving the client just enough to vacation comfortably among the trees. The Marysville house is an exercise in restraint, placed appropriately in a landscape that needed as much help as it could get after such a horrible environmental event. Steffen Welsch Architects crafted the perfect little holiday cabin, that never did anything more than it needed to in a brilliant and harmonious co-existence.